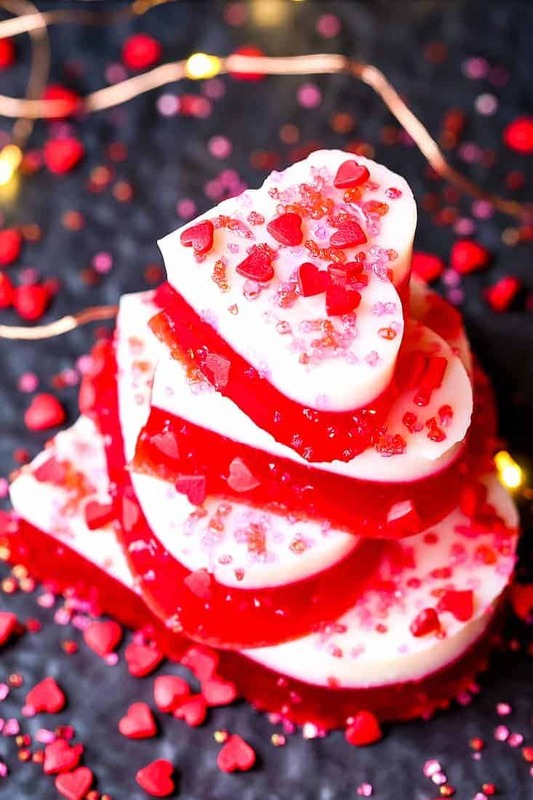 These Valentine’s Day Jello Shots are so fun, they’ll be the hit of your Valentine’s Day party! This jello shot recipe is as easy as it is delicious! 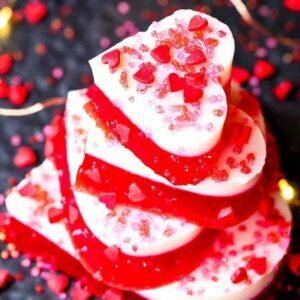 We’ve got lots of boozy desserts for Valentine’s Day! Try these Coconut Rum Cookies, or our famous Fireball Whiskey Cheesecake Shots or this no bake Banana Bourbon Poke Cake. Need another Jell-O Shot recipe? 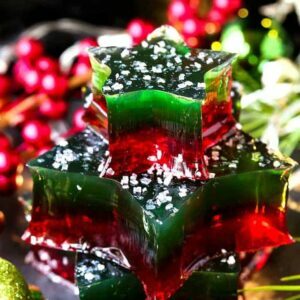 Try these Champagne Jello Shots that can be customized for any holiday! Now, the term “shot” here is taken pretty loosely. This jello recipe is more like a jello jiggler, but with RumChata. So as not to confuse any kids in the room, I’m calling them jello shots. We all get the idea that booze is involved that way! 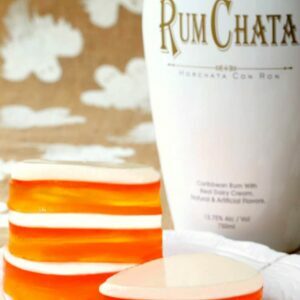 And there is quite a bit of RumChata going on in this jello shot recipe so buckle up. For the white, RumChata layer you start with a clear gelatin, then flavor and color it with RumChata. For the red layer you can use raspberry, strawberry or cherry jello, whichever flavor you prefer. You can also switch up the colors, flavors and shape of these jello shots to make them work at any party or holiday! What Kind of Alcohol Can You Use In A Jello Shot Recipe? Well, pretty much anything you like. Vodka is a popular choice because it’s colorless so it doesn’t change the look of the jello. But you can add rum, tequila, even gin. The basic idea here is that you’re substituting some of the water in the recipe for the booze. BUT you can’t add too much booze or else the jello won’t firm up. So follow the proportions here and you’ll be good to go. And if you want to add even more booze to these jello shots you can swap out some of the water for the red layer and add you booze of choice. I’m sticking with the plain red layer and the solid white RumChata layer for these jello shots. I’m assuming that more champagne cocktails will be involved too on Valentine’s Day so one layer of booze is going to be just fine! These jello shots only take a few hours to set up, but if you have overnight that’s good too. Garnish with sprinkles right before serving so they don’t melt into the jello. 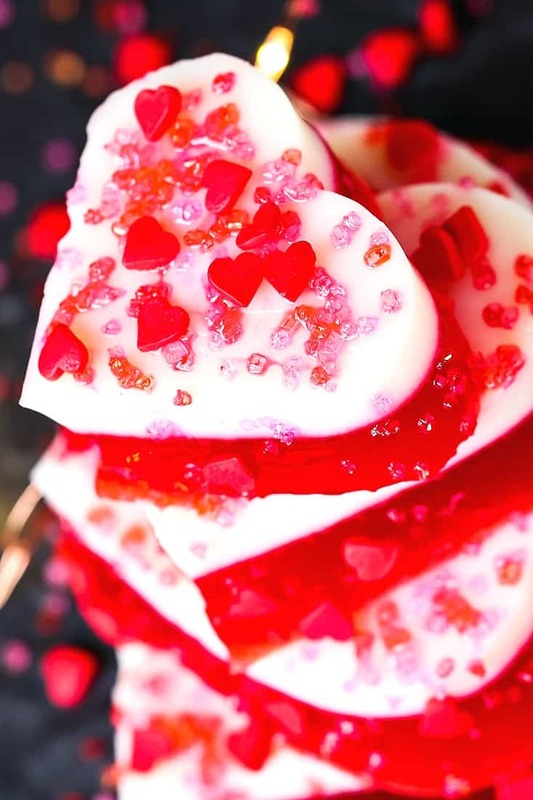 These Valentine’s Day jello shots are perfect for a boozy, no-bake dessert! 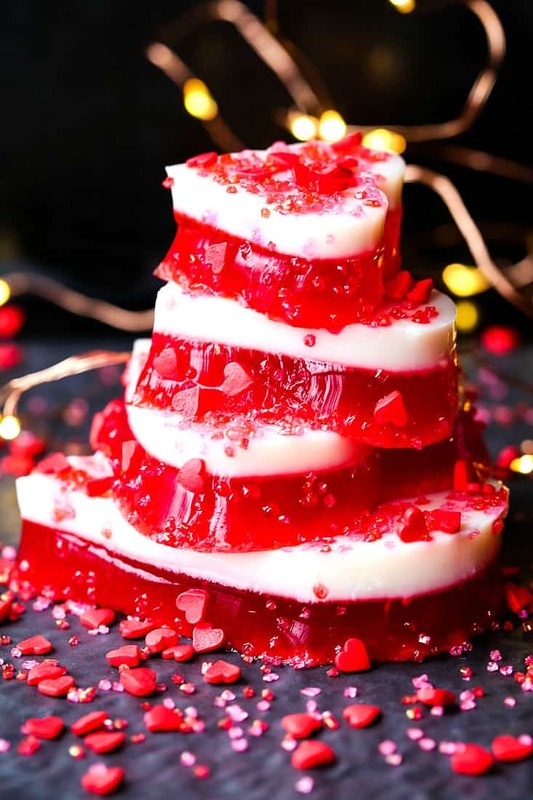 This jello shot recipe can be customized for any party or holiday! Add 1 cup of water and a 1/2 cup of RumChata to a small pot. Sprinkle the unflavored gelatin over the liquid and let bloom for 5 minutes, with no heat on. Turn the heat on medium/low, whisk the gelatin into the liquid until smooth and bring to a simmer for 5 minutes. Pour the gelatin into a 1 quart dish, then stir in the other 1/2 cup of RumChata. Place in the refrigerator for at least an hour until set. Add the red Jell-O to a bowl then carefully add 1 1/2 cups boiling water. Whisk until the gelatin is dissolved, then slowly pour over the white layer of gelatin. 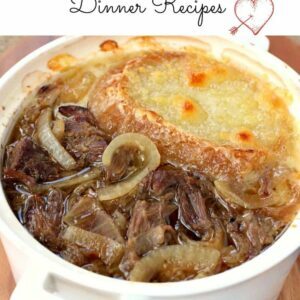 Return to the refrigerator for at least another hour or up to overnight. Cut into desired shapes, garnish with sprinkles and serve. Swap out different colors of jell-o to make these jello shots perfect for any party!